A great mentor who I worked with my first year as a part time 2nd teacher had stations around her room at which students quickly got their materials. I loved the idea and tweaked it to work for me. I usually have my classes in 5 rows, ideally around 5 kids each, but sometimes up to 6 in a row if I have more than 25 students in a class. In Kindergarten, I just have 4 rows and near the end of the year, I use the stations for them to start getting them used to using them. This procedure becomes the procedure I use in every grade. It helps students to get their materials quickly so we don’t waste time in our short 30 minutes of class time. I have 5 stations around the room. 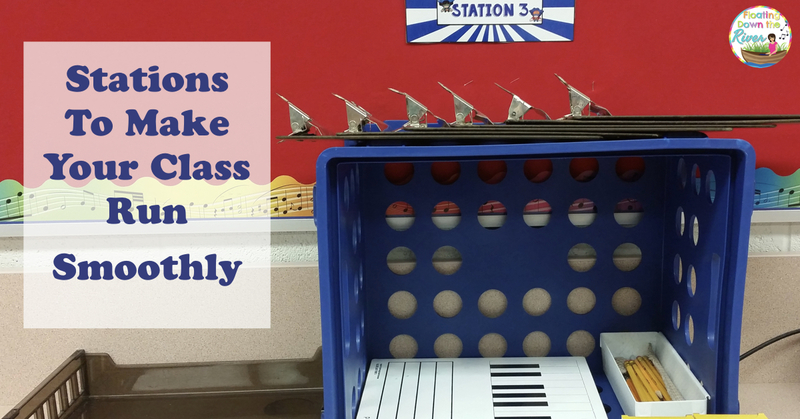 Each station is an inexpensive plastic crate– the kind they sell at the beginning of year for college kids. At the station is a music write on/wipe off board. I got them at West music, and although they are expensive, I use them a lot. I also have an inexpensive white tray that I got at Walmart with pencils in it. On top are clipboards so the kids can write on a hard surface when we have paper and pencil work. Beside the station is a tray for their work. There are crayons in a pile at the station as well. At the beginning of the year, we review how to line up at the stations. The first row in front of me goes to station 1. The second goes to stations 2, etc. They are to line up in a straight line and one student at a time gets his or her clipboard and a pencil (crayons if needed). Then they come to me for the paper they need. I have gotten in the habit of singing “Clipboard, pencil, come and get a paper” to help the kids remember what they need to do. They have gotten into the habit of singing it as they go get them. When the students are done, I sing, “clipboard, pencil, put away your paper” and the students take their boards and pencils back and put their papers in the tray next to their station. I emphasize putting the clipboards in a nice order and straight, so they don’t fall all over. I also emphasize putting pencils into the pencil tray, crayons back where you found them, and papers in the tray beside the station. I compliment rows that get things put away nicely and eventually, they get pretty good at it. This system works very well for me and helps to keep things from getting congested. Get your free station labels here. Love the idea! Does each station focus on the same thing? Do they ever switch stations? These are just stations for getting materials in my room, but it would also work well for centers! Love how you have organized your supplies all together so that students can just pick up what they need and move back to their place. Thank you, Mark! It works very well to keep kids organized and to help them get them quickly and return them quickly.